itsme is a highly user-friendly identity verification service for Belgium. It uses banking-grade verification through secure channels to help you bring customers online without a hitch. Let’s find out how it works and what benefits it offers for your business. With its customer-centric UX-design, itsme is used by businesses and government institutions to reliably verify customers’ identity when they sign up for online portals or apps. The applications are endless, from e-commerce purchases to getting insurance cover and signing official documents. itsme is set to expand its coverage beyond borders; the tool should go live in Luxembourg in late 2018. 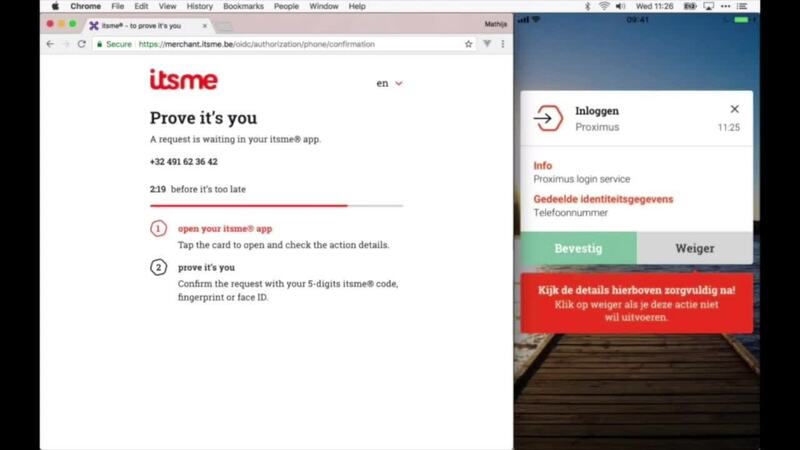 The customer links the itsme app to their digital identity using their Belgian eID (an identity card with a chip available to all residents of Belgium) and card reader. The customer can now use itsme to share data, log in, confirm (transactions, changes to contracts, etc.) or sign documents (launching soon). The customer’s identity is verified using identity data from their bank through a secure channel. The identity data is never stored on the customer’s device. Businesses can customize the itsme onboarding flow to their exact specifications: from the number of identification factors (including fingerprint or pin code) to which personal details they receive about their customers. How can itsme help your business? First and foremost, itsme offers the highest possible level of security and assurance of your customer’s identity. But to benefit from these advantages, your customer must first sign up successfully to use your online platform or app. That is why itsme is designed to offer a seamless customer experience. It is easy to sign up and the customer has full control over the data they are sharing with you. These customer-centered elements also will help you become (and remain) GDPR-compliant. Since the data sharing feature is fully customizable, you will never have superfluous data (data minimization). You also automatically offer full transparency to your customer. Finally, online customers are much more valuable than offline customers; you will not only save cost by going digital (fewer helpdesk calls, lower postage costs, etc. ), but also get more value out of each customer by personalizing their online experience and offering relevant products or services for added value. This will also increase your customer loyalty and engagement with your brand, allowing you to stay one step ahead of the competition. itsme can be incorporated seamlessly into your onboarding process. What information do I need from the customer, and what will I use it for? How can I link my existing customers to their itsme accounts? How can I organize the back-end so that my customer can have seamless experience at the front-end? This is particularly useful for larger enterprises that have organized their product offering into ‘silos,’ forcing customers to log into separate accounts for different things, such as car insurance and life insurance from the same provider. Unifying this experience will greatly improve customer satisfaction. A comprehensive CIAM platform like Onegini Connect can help you resolve all of your onboarding questions, streamline your overall customer experience and link up internal systems and databases. It offers integrations with a range of identity verification solutions including itsme (for Belgium and Luxembourg), BankID (for Scandinavia), and iDIN (for the Netherlands), so you can offer the same high standard of identity verification across borders. Acting as a hub for all the different silos in your organization, Onegini Connect will also allow you to improve the efficiency of your internal processes by promoting a more holistic view of the customer. On top of that, you can collect user data to enrich customer profiles, which gives you the chance to offer personalized products and services for added value to your customer. In short, Onegini Connect can provide that unified, enriched customer experience you need to offer an online environment your customers will love. Want to find out the best way for your business to bring customers online? Our onboarding assessment team is happy to help you out. Get in touch with us today for a no-strings consultation.